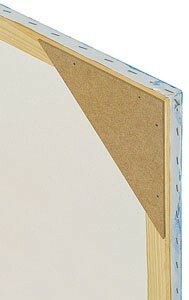 To insure that canvas corners remain square, nail one hardboard corner to each corner on the back of each canvas stretcher bar. Pieces are cut at an exact 90° angle, with pre-drilled holes for effortless mounting. 8" x 8"